A team of scientist sounds the alarm in a new Science Policy Forum report about a mysterious US government program that is developing genetically modified viruses that would be dispersed into the environment using insects. The virus-infected or 'Frankenstein' insects are being developed as countermeasures against potential natural and engineered threats to the US food supply. The program is operated by the Pentagon’s Defense Advanced Research Project Agency (DARPA) could be viewed as an attempt to develop an entirely new class of bioweapons that would prompt other nations to seek similar weapons, they cautioned. The researchers from the Max Planck Institute for Evolutionary Biology and the University of Freiburg both in Germany, and the University of Montpellier in France suggest DARPA's program could likely breach the Biological Weapons Convention, the first multilateral disarmament treaty banning the development, production, and stockpiling of biological and toxin weapons. Dubbed the "Insect Allies" program, DARPA began modifying insects in 2017, with the plan to produce more resilient crops to help farmers deal with climate change, drought, frost, floods, salinity, and disease, said Gizmodo. The technology at the center of the program is an entirely new method of genetically modifying crops. Instead of modifying seeds in a lab, farmers would send swarms of insects into their crops, where the genetically modified bugs would infect plants with a virus that passes along the new resilience genes, a process known as horizontal genetic alteration. Hence the technology’s name—Horizontal Environmental Genetic Alteration Agents (HEGAA). However, the lead author of the report, Richard Guy Reeves from the Department of Evolutionary Genetics at the Max Planck Institute for Evolutionary Biology, says DARPA's Insect Allies program is disturbing and an example of dual-use research in which the US government, in addition to aiding farmers' crops, is also developing a biological weapon. Insect Allies is reportedly backed by $27 million of funding. According to Gizmodo, there are four academic research teams currently working on the project, including researchers at the Boyce Thompson Institute in New York, Pennsylvania State University, Ohio State University and the University of Texas at Austin. DARPA maintains that "all work is conducted inside closed laboratories, greenhouses, or other secured facilities," and that the insects have built-in lifespans to limit their spread. 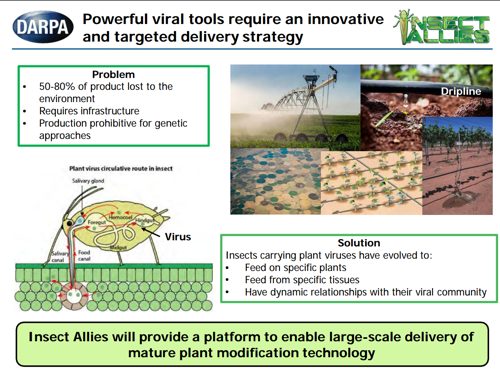 By 2020 or 2021, DARPA is planning on testing the virus-infected insects on crops inside greenhouses at undisclosed locations. Reeves said the use of insects as a vehicle for genetic modification is a horrible idea because they cannot be controlled and indicates that traditional overhead sprays to deliver HEGAAs is the safest bet. DARPA says insects are the only practical solution, as overhead spraying of HEGAAs would require increased farming infrastructure -- something that is not available to all farmers. The scientists of the report interpret DARPA's insect program as "an intention to develop a means of delivery of HEGAAs for offensive purposes," such as conducting biological warfare. These genetically modified bugs could be implanted with a dangerous plant-killing disease that the Trump adminstration could unleash over farmland in Venezuela, Syria, Iran, North Korea, Russia, and or even China, that would decimate the countries' food supply. In response to a Gizmodo question, a spokesperson for DARPA said it welcomes academic dialogue about the Insect Allies program, but criticizes the conclusion of the report, saying it is "misleading and peppered with inaccuracies." "DARPA is not producing biological weapons, and we reject the hypothetical scenario," Bextine told Gizmodo. "We accept and agree with concerns about potential dual use of technology, an issue that comes up with virtually every new powerful technology. Those concerns are precisely why we structured the Insect Allies program the way we did, as a transparent, university-led, fundamental research effort that benefits from the active participation of regulators and ethicists and proactive communication to policymakers," said Bextine. "DARPA is extraordinarily sensitive to environmental risks and off-target effects, and has structured the Insect Allies program to identify and mitigate them," he said. "DARPA has mandated multiple levels of biosafety and biosecurity at each stage of the program." If DARPA’s program succeeds, they will have developed gain-of-function treatments that can be delivered to the "right plants" and the "right tissue," he said. In other words, DARPA wants precision guided biological weapon insects. Jason Delborne, an Associate Professor at North Carolina State University, an expert in genetic engineering, says the concerns seem "appropriate." "The social, ethical, political, and ecological implications of producing HEGAAs are significant and worthy of the same level of attention as exploring the science underpinning the potential technology," Delborne told Gizmodo. "The authors argue persuasively that specifying insects as the preferred delivery mechanism for HEGAAs is poorly justified by visions of agricultural applications. The infrastructure and expertise required for spraying agricultural fields—at least in the U.S. context—is well established, and this delivery mechanism would offer greater control over the potential spread of a HEGAA." DARPA could be on the cusp of obtaining a new biological weapon that would most certainly be used against Venezuela, Syria, Iran, North Korea, Russia, and or even China, to cripple the countries' food supply and lead to a regime change without firing a signal shot -- this the future of warfare.